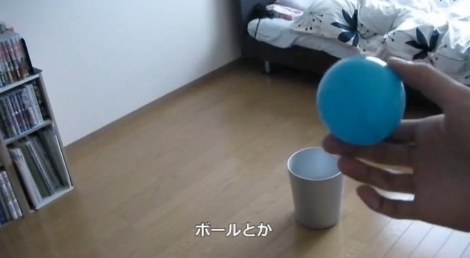 This guy is about to toss the blue ball half way between the book shelf and the waste basket. By the time it gets there the waste basket will have moved into position to catch the ball perfectly. It’ll do the same for just about anything you throw. We’re unable to read the captions but it looks like this may have been made as part of a commercial which is shown in the first few seconds of the video after the break. From there we see the development of a locomotive mechanism which will fit into the bottom of the bin. It start as a single swivel wheel, but gets more complicated quite quickly. Once the low-profile three-wheeler is milled and assembled it’s time to start writing the code to translate input from a Kinect 3D camera and extrapolate the position for catching the trash. The final result seems to do this perfectly. Your bench supply doesn’t need to look sad just because you’re using an ATX power supply instead of a commercial product. Follow [Ian Lee’s] example and you could have beautiful wooden enclosures for the tools in your own shop. The woodworking skills used here aren’t all that advanced, but you need to have a knack for it so we suggest running some test pieces before you start the actual build. [Ian] ran a dado for the front and back panel in each piece of the wood sides. At each corner the inside of the the pieces were mitered at 45 degrees. To put it all together he laid the pieces end to end on a the work bench, then applied painters tape to the outside of the joints. This holds the joints together so that he can flip the collection over, apply glue, and then start hinging the sides into place. It’s almost like rolling up a box. 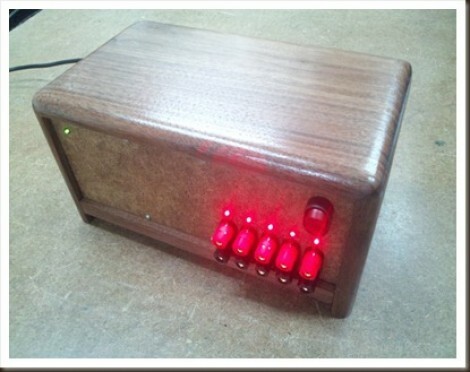 As with other ATX supply projects we’ve seen [Ian] designed this so that the PSU can be swapped out later if necessary. Instead of wiring his own cable harness he used an ATX breakout board. To get the interface layout he wanted he mounted the banana jacks separately and just ran jumper cables back to that board. 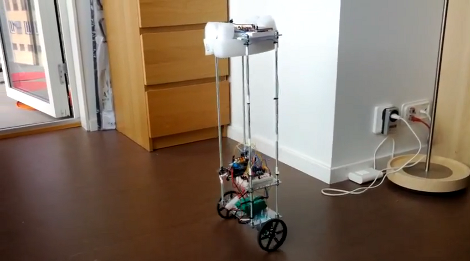 At this point we’re beginning to think that building a self-balancing robot is one of the rights of passage alongside blinking some LEDs and writing Hello World on an LCD screen. We’re not saying it’s easy to pull off a build like this one. But the project makes you learn a lot about a wide range of topics, and really pushes your skills to the next level. This latest offering comes from [Sebastian Nilsson]. He used three different microcontrollers to get the two-wheeler to stand on its own. He used our favorite quick-fabrication materials of threaded rod and acrylic. The body is much taller than what we’re used to seeing and to help guard against the inevitable fall he used some foam packing material to protect the top level. Three different Arduino boards are working together. One monitors the speed and direction of each wheel. Another monitors the IMU board for position and motion feedback, and the final board combines data from the others and takes care of the balancing. Two PID algorithms provide predictive correction, first by analyzing the wheel motion, then feeding that data into the second which uses the IMU feedback. It balances very well, and can even be jostled without falling. See for yourself in the clip after the break. 2.4 GHz video transmitters are everywhere these days, in many, many products ranging from baby monitors to CCTV setups. Surprisingly, most owners of these video devices don’t realize they’re transmitting an unencrypted video signal, a belief [Benjamin] hopes to rectify. [Ben]’s project started with him driving around cities recording unencrypted 2.4GHz video feeds. His idea has since expanded to include building metal boxes with an LCD display and attaching them to light poles. Think of it as an education via technology; most people don’t know these devices are receivable by everybody, and showing them it is possible is the first step in learning. 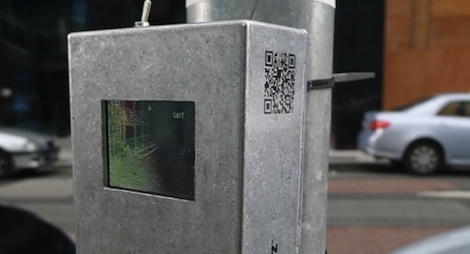 If you’re looking for something a little more creepy than a metal box attached to a lamp-post, [Ben] is also the brainchild behind the Surveillance Video Entertainment Network, an installation (also in van form) that exposes unencrypted 2.4 GHz video transmissions in cities around the world. You can check out a few intercepted surveillance videos after the break. 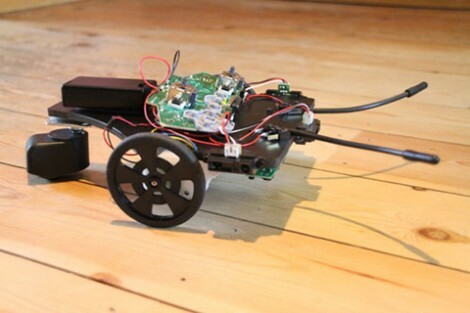 Wow, it’s amazing what [Carl] was able to build using an Xbox 360 control PCB as the base for his robot. His forum posts just touches the surface of the build, but he linked to a PDF file which has the full details. This build basically attaches sensors and replacement motors to the controller board… and that is it! Some distance sensors are connected to the analog inputs for the left and right trigger. The whiskers use a couple of leaf switches soldered to controller button pads. The motors are geared replacements that use the same connectors as the rumble motors did. The idea is that the controller is connected to a PC via the wireless radio it has on the PCB. Once the connection is made the PC software can read from all of the sensors and drive the motors accordingly. It would also be really easy to use a single-board solution like the RPi to do away with the need for a remote PC. But this is a fantastic start, and an approach which we had never before considered. See some video of the little guy getting around the room after the break. We take our digital life for granted these days, but back in 1943 it was vacuum tubes, not transistors, which made it all possible. This video on the types and industrial uses of vacuum tubes was sent into the tips line by [Polar Bear]. The nearly 70-year-old video is part of a collection preserved by the New Jersey Amateur Radio Club. 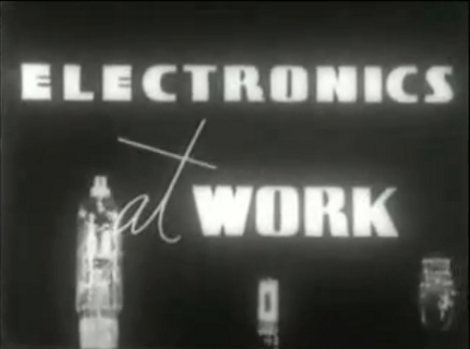 The video was underwritten by Westinghouse, and as you can expect it has a bit of propaganda spin for the company. The time period in which the reel was produced is also telling. Coming about two years after the attack on Pearl Harbor, the applications for technology of the time are almost all military in focus. But we’re sure you’ll be entertained by both the film style and the tech explanation. It’s something of a How It’s Made of yesteryear. All twenty-one minutes of it are found embedded after the break. The Dark Knight Rises is out now, and [Christian] over at MakeIt Labs decided to show up everyone at this year’s Halloween party with these custom made Batarangs. After the Batarangs were plasma cut out of 11-gauge steel, [Rob] beveled the trailing edges of the wing, powder coated them, and sharpened them with a grinder and a diamond stone. Yes, these Batarangs are probably much better weapons than the on-screen logo shaped shuriken, but it’s questionable how useful they are compared to perfectly balanced CGI weaponry. They’re a really awesome looking build perfect for this year’s Halloween costume. One small word of warning for all the commentors: We know a few of you have already seen the midnight showing of The Dark Knight Rises, but posting any spoilers will result in a member of the Hackaday team hunting you down and savagely beating you. Also, given the shooting at the premier in Aurora, Colorado you probably don’t want to bring weapons – even prop ones – to a movie theatre. You can check out the making of video for [Christian]’s Batarangs after the break.